Bliss and Foodie have teamed up with Naked Juice for a program that’s all about summer recipes that include Naked’s new juice, Power Garden, as a main ingredient. Whether it’s a Bloody Mary with Tomato Kick or these yummy Berry Cupcakes using Berry Garden, the juice will make any recipe healthier. Each recipe will be featured in Bliss and Foodie’s “Pin It To Win It! Win A Naked Juice Garden Gift Basket” sweepstakes on Pinterest. Users will vote for their favorite recipe by re-pinning it for a chance to win a Naked Power Garden prize pack full of gardening goodies! After sipping on both Tomato Kick and Berry Garden, I tossed around ideas of both savory dishes and sweet treats. What to make? In the end, I decided to go with a cupcake that has summer written all over it. Berries are a quintessential fruit this time of year and when combined into a cupcake with a mascarpone frosting, it screams red, white & blue! Perfect as a beautiful addition to any Fourth of July celebration, don’t you think? Come back and visit with me on Monday, June 17th for more information on how you can vote for my recipe & enter the Pinterest Sweepstakes contest with Naked Power Garden! Power Garden is Naked Juice’s new veggie drink lineup with 1lb. of veggies in every bottle*. With delicious flavors that only Naked could blend, Power Garden offers one of the easiest ways to get your daily servings of veggies and fruits, along with good sources of fiber, vitamins and minerals. Learn more at http://www.nakedjuice.com/veggiedrinks. *Weight of vegetables, prior to juicing. 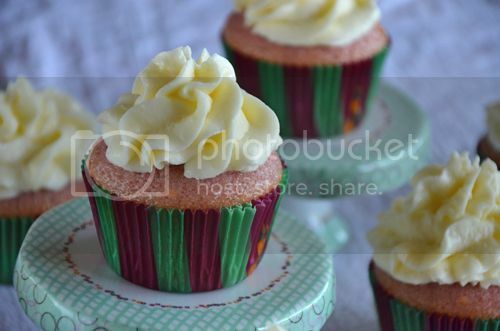 Preheat oven to 350 degrees F. Line cupcake tins with liners and spray each one with a small amount of non-stick spray. In a medium-sized bowl, whisk together the flour, sugar, dry buttermilk, baking powder and soda; set aside. In a larger bowl, whisk together the water and Naked Juice Berry Garden. Then add the egg whites, oil and vanilla extract, mixing until smooth. Using a hand mixer, add the dry ingredients a little at a time, beating until just incorporated. 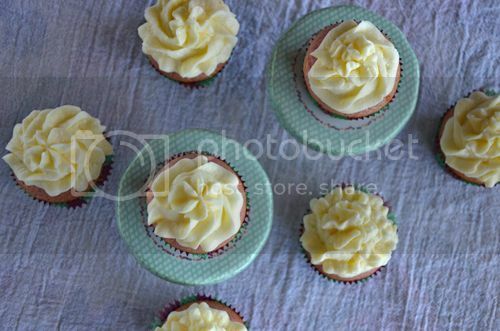 Add batter to each cupcake liner, filling 2/3 full. 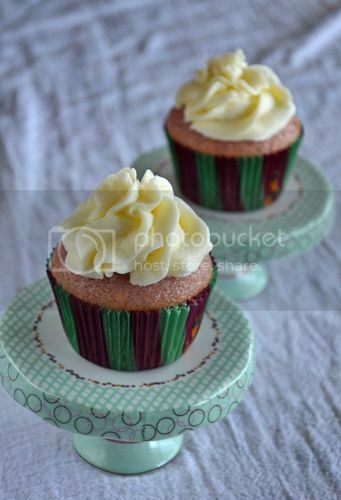 Bake for 20 minutes or until a toothpick inserted into the middle of a cupcake comes out clean. Remove from oven and cool completely before frosting. While the cupcakes are cooling, make the frosting. Beat the butter on high speed, until it is light and fluffy. Scrape and repeat to make sure all the butter is beaten. Add the mascarpone and beat on medium speed, until just blended. Sift the Confectioners' sugar over the butter and mascarpone mixture and quickly beat on medium speed, until just smooth. Refrigerate for 30 minutes to an hour before using. Yum! What a great idea for a cupcake base! My mom is a huge fan of these products, so I know she would love these cupcakes! Need to give this a try!!! Looks awesome! Great looking cupcakes. I have never used Mascarpone cheese for bake goods but I think I should 🙂 I love Mascarpone cheese. It was great meeting you at blogher food. Hopefully we will meet again soon!! I love Naked juice! So fun that you made cupcakes with it.